Given the following path (for example) which describes a SVG cubic bezier curve: "M300,140C300,40,500,40,500,140", and assuming a straight line connecting the end points 300,140 to 500,140 (closing the area under the curve), is it possible to calculate the area so enclosed? Convert the path to a polygon of arbitrary precision, and then calculate the area of the polygon. // Create segments evenly spaced between two points on the path. // If the area of the result is less than the threshold return the endpoints. // Otherwise, keep the intermediary points and subdivide each consecutive pair. Following is the original answer, which uses a different (non-adaptive) technique for converting the <path> to a <polygon>. At its core the above demo uses functions for approximating a path with a polygon and computing the area of a polygon. that provides the closed form solution, using the divergence theorem. I am surprised that this link has not been found by the OP. An interesting problem. For any piecewise differentiable curve in 2D, the following general procedure gives you the area inside the curve / series of curves. For polynomial curves (Bezier curves), you will get closed form solutions. Let g(t) be a piecewise differentiable curve, with 0 <= t <= 1. g(t) is oriented clockwise and g(1) = g(0). Then div(F(x, y)) = 1 where div is for divergence. where int is for integration, ' for differentiation and dot for dot product. The integration has to be pieced to the parts corresponding to the smooth curve segments. Calculate this for each curve in the sequence and add them up. The sum is the area enclosed by the curves (assuming the curves form a loop). Hope I did not do mistakes. Firstly, I am not so familier with bezier curves, but I know that they are continuous functions. If you ensure that your cubic curve does not intersect itself, you may integrate it in closed form (I mean by using analytic integrals) on the given enclosing domain ([a-b]) and subtract the area of triangle that is formed by the the end joining straight line and X axis. In case of intersection with the Bezier curve and end joining straight line, you may divide into sections and try to calculate each area separately in a consistent manner..
For me suitable search terms are "continuous function integration" "integrals" "area under a function" "calculus"
OF course you may generate discrete data from your bezier curve fn and obtain discrete X-Y data and calculate the integral approximately. I like the solution in the accepted answer by Phrogz, but I also looked a little further and found a way to do the same with Paper.js using the CompoundPath class and area property. See my Paper.js demo. with B(t) being the point on the Bézier curve and Pi the Bézier curve defining point (see above, P0 is the starting point, ...). t is the running variable with 0 ≤ t ≤ 1. This form makes it very easy to approximate a Bézier curve: You can generate as much points as you want by using t = i / npoints. (Note that you have to add the start and the end point). The result is a polygon. 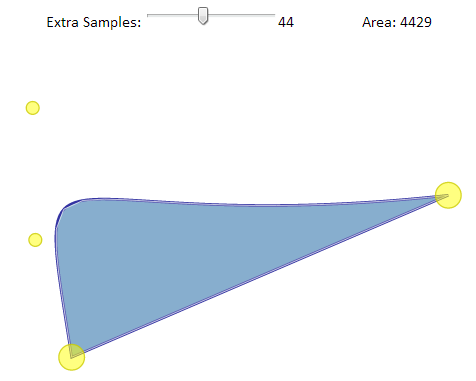 You can then use the shoelace formular (like @Phrogz did in his solution) to calculate the area. Note that for the shoelace formular the order of the points is important. By using t as the parameter the order will always be correct. The result here is an area of 300. The shown figure has a length of 30 and a height of 10. The "waves" are symmetric, they are canceling out eachother. So the area is correct. 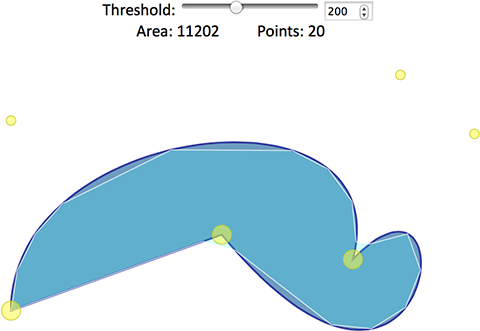 *  Approximate the bezier curve points. // the order of the points is correct. // the area will get a weird result. *  Get the bezier curve values of THIS example path. *  implementing the shoelace formular. 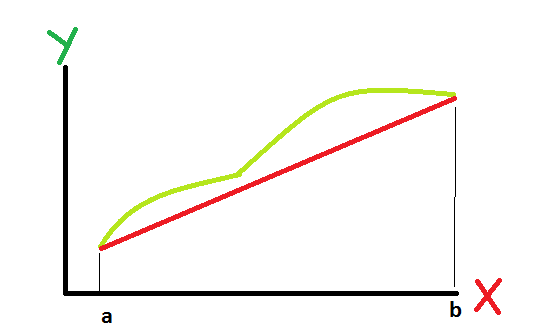 How to calculate the Area of a SVG 'Path' element in Java ?